What does the term "ABC Poker" mean? 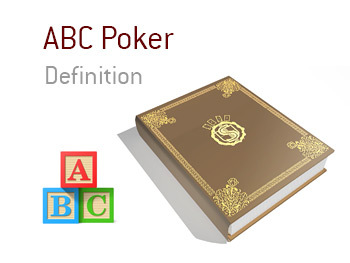 What is the definition of the term "ABC poker"? In poker, playing "ABC Poker" means that you are playing by the book. It means that you are not doing anything to really trick your opponents - instead, you are getting rid of your weak hands and playing your strong hands as boldly as possible. The problem with playing ABC poker is that strong opponents will pick up on your tendencies quickly. If you are never disguising your hands or mixing up your play, you will send off some pretty strong tells. For people who have picked up on your tendencies, they will basically never get involved in pots with you. In addition, they will be frequently able to get you off of weaker hands. ABC poker works in some situations (for instance, lower level SNGs online), but in bigger tournaments with a wide mix of players, you need to be able to mix your game up a bit.